I’ve had it with weather, and I’m not going to take it anymore. I’m sick of checking my Weather Channel app every morning to figure out how to dress and if I need an umbrella or a sweater. When I design my own planet, there won’t be any weather. Seventy degrees Fahrenheit and partly cloudy all the time, that’s what I say. Partly cloudy, you ask? I’m not greedy, that’s all, plus whenever I wear sunglasses I look like I’m trying to do some disturbing Top Gun parody. I also hate talking about the weather, which is a fallback whenever you have nothing in common with the person you’re talking to. It’s not that I’m against the polite fictions that lubricate the gears of the social contract; it’s just that, like Oscar Wilde, “Whenever people talk to me about the weather, I always feel quite certain that they mean something else. And that makes me quite nervous”. Admittedly, I had the lack of foresight to live in a geographic location that has the traditional four seasons: (1) raking leaves, (2) shoveling snow, (3) pollen, and (4) sweat. It turns out I need not live this way, and I don’t need to relocate to achieve my ultimate goal. I simply need to engage the services of a tempestarii, one of the two traditional categories of European witches. A witch is a witch, you say? Medieval theologians disagree. And if you disagree with a medieval theologian they have a distressing tendency to turn you over to the tender mercies of the Inquisition. What do you got to say now, punk? I didn’t think so. Mythological traditions of weather control through various forms of shamanism, sympathetic magic, and witchcraft have a proud historical track record cross-culturally. The wind in particular has long been associated with supernatural power, probably due to the fact that it reminds us that an unpleasant fate is continually breathing down our neck. The wind was also regarded as a living being whose power was to be dreaded. It punished King Loegaire for breaking his oath. But it was also personified as a god Vintius, equated with Pollux and worshipped by Celtic sailors, or with Mars, the war-god who, in his destructive aspect, was perhaps regarded as the nearest analogue to a god of stormy winds. Druids and Celtic priestesses claimed the power of controlling the winds, as did wizards and witches in later days. This they did, according to Christian writers, by the aid of demons, perhaps the old divinities of the air. Bishop Agobard describes how the tempestarii raised tempests which destroyed the fruits of the earth, and drew “aerial ships” from Magonia, whither the ships carried these fruits. Magonia may be the upper air ruled over by a sky god Magounos or Mogounos, equated with Apollo. The winds may have been his servants, ruled also by earthly magicians. Like Yahweh, as conceived by Hebrew poets, he “bringeth the winds out of his treasures,” and “maketh lightnings with rain” (MacCulloch, 1911, p180). The medieval Catholic Church was very careful to distinguish between witchcraft of the “malefici” variety (designed to injure or murder a person) and the “tempastarii” (intended to encourage bad weather). Now the Catholic Church in the Middle Ages was not generally so scrupulous when it came to sorcery, basically looking askance at any kind of attempt to use magic to alter reality and lighting up the barbecue, unless of course, it involved something divinely miraculous or saintly. And it’s not like they wouldn’t imprison, torture, or burn you if the extent of your occult dabblings only involved some climatic adjustments, it’s just that while they argued about things like the number of angels on the head of a pin and engaged in the dubious joys of scholastic dialectics, they similarly felt compelled to categorize the different kinds of witches into a taxonomy of heretical activities. In the modern world we call this obsessive compulsive disorder, or alternatively, librarianship. Why differentiate between witchcraft meant to harm individuals and witchcraft meant to control the weather, unless of course you just needed to keep some monks busy? Those monks get into the wine and wafers if you don’t keep them occupied. In all likelihood, this probably had something to do with the compulsion to stomp out the last vestiges of overt paganism in its many flavors, which is no doubt the go-to hobby of orthodox theocracy wherever it rears its ugly head. You simply can’t have folks running about calling upon heathen gods to smite their enemies whenever they sleep with your sister. It would be anarchy. You’ve got to put a stop to that kind of nonsense, or at least replace it with the institutionally approved version of that nonsense. Weather control is a little trickier from a practical perspective. Scholars estimate that even as late as the 16th Century A.D. in Europe, 75% of the population was gainfully employed in agriculture (this dropped to 10% by our modern, enlightened era), but worldwide today, over a third of the available workforce (about 1 billion people) still spend their days farming. In light of hearing this, I intend to invest in overalls and tractors. Tractors, because they seem essential to efficient modern farming. Overalls, because that’s how I roll. Don’t mess with me. I have contacts at the Congregation for the Doctrine of the Faith (the polite name the Inquisition goes by these days). Back to the Dark Ages (no, the ones before the 1970’s). So, there they were, the dominant organized religion throughout Europe, and Christianity was looking to crack a few pagan skulls, just on principle. If you were going around making demonic pacts, casting the evil eye about, and generally getting witchy in the interest of felonious assault and murder, it was clearly open season on you, my friend, as assault and murder without the stamp of approval of the church was just not kosher. Those weather witches, the tempestarii, were a little more problematic, since most people were eking out a living on the land, and the primary uncontrollable and unpredictable force that can really ruin a farmer’s season is the weather. Early frosts, flooding rains, droughts, hail, hurricanes, and all manner of inclement and unexpected weather can wipe out crops, livestock, and livelihood without warning. Praying to some ineffable supreme god that moves in mysterious ways for a successful harvest seems a bit chancy in these circumstances, and farmers by necessity, are practical people. H.L. Menken once said, “Nobody hates his job as heartily as a farmer”, but what I think he meant to imply is that farming is gambling, where the payoff is never big, and the house reserves the right to change the rules of the game without notice, often in the middle of a hand. Freaking weather. That’s the problem. Thus, understandably, one of the most persistent forms of witchcraft was the kind that could even the odds a little bit for agriculturalists, so enduring in fact, that the fathers of the church, the kings and princes, and the learned theologians of the Middle Ages felt it needed to be called out separately from all those other nefarious sorts of sorcery. The other problem the Catholic Church had with tempestarii was that they were impinging on the Church’s divine protection racket, siphoning off lucrative tithes (in the form of cash or crops) to pay off tempestarii or anti-tempestarii (there was a thriving business of folks who claimed they could use their sorcerous powers to ward off the depredations of tempestarri). And if there is one thing God doesn’t abide, it’s some upstart witch extorting money on his turf. He won’t leave a horse’s head in your bed, but he might get all wrathful and turn your city to ashes and all your friends into pillars of salt. You know…the “Chicago Way”. Most cultures have some version of the tempestarii, with varying degrees of malevolence. “The faculty of exciting tempests has been generally credited throughout the world, as pertaining to sorcerers; and sometimes both the peculiar agitation of the elements, and the means of inducing it are described. It was assigned by the ancients to the Telchines, a people of Rhodes and in the middle ages, to other tribes than the Tartars, such as the natives of Tibet, Kashmire, and the islanders of Socotora in the Eastern seas, as illustrated by Marco Polo in various passages. No doubts were entertained of it in Europe” (Dalyell, 1835, p249). The association of the tempestarii and their cousins with attacks on agriculture dates into the remotest antiquity. The raising of hailstorms and spoiling of crops by magic reaches back to the remotest antiquity of almost every nation. As benignant gods make the fruits to thrive, as air-riding valkyrs from the manes of their steeds let life-giving dew trickle down on the plain; so baneful beings of magic power strive to annihilate all that is green. The Greek Eumenides (a word that even our oldest glosses translate by hazasa) spoil the crops with their slaver, and the fruit with hailstones, (Aesch. Eum). The Roman Twelve Tables imposed a penalty on him “qui fruges excantassit . . . sive . . . alienam segetem pellexerit.” In the 8-9th century ‘weather-making ‘ was alleged against sorcerers rather than sorceresses; tempestarii, not tempestariae. So, in Ratherius ‘contra eos qui dicunt quod homo mains vel diaholus tempestatem faciat, lapides grandinum spergat, agros devastet, fulgura mittat, etc’. Those magicians in Burchard are called immissores tempestatum. Yet in the North, Thorgerer and Irpa, who stir up storm and tempest, are women, and the salt-grinders Fenja and Menja giantesses; their ship is like the mist-ship of the clouds. How magicians set about their weather-making, is nowhere specified. In much later authorities we find them using a tub or a pitclier (Grimm, 1880, p1086). While we’ve always been sure there is some awful fellow out there manipulating the weather, the motivations ascribed to such a dastardly activity vary rather widely. A particularly Northern European version of the tempestarii were not so interested in destroying crops as they were in raising storms to torment sailors (or extract protection money from sea-faring folk in order to not send nasty winds at them). This association of the tempestarii with nautical phenomena would play out in some odd ways in their more Western European incarnation. The Lapp witches of the Yokkonga used to frequent the promontory to assist in the worship of the Paata of the Holy Cape: and they would sell a fair wind to the English sailors who traded to the White Sea. This was a wide-spread superstition. In the Capitularies of Charlemagne at Aix-la-Chapelle were penalties against tempestarii, such as raise storms and tempests: in the ancient Norwegian statutes were similar provisions. An Icelandic chronicle relates how the Bishop of Skalholt allayed a storm with holy water. Mela tells how on the lies de Sein, off the Brittany coast, lived priestesses who had the winds and tempests at their disposal (Rae, 1881, p89). Apparently, the tempestarii migrated westward, carrying with them a certain Teutonic flavor that would eventually mix with similar Celtic notions. One may remark upon this 1st prerogative of the verses known to Odin, that among all the ‘Gothic and’ Celtic nations, the Magicians claimed a power over the Winds and Tempests. Pomponius Mela tells us, that in an island on the coast of Bretagne (he probably means the Isle of Saints, opposite to Brest) there were priestesses, separated from the rest of the people, who were regarded as the Goddesses of Navigation, because they had the winds and tempests at their disposal. There are penal statutes in the Capitulries of Charlemagne, in the canons of several councils, and in the ancient laws of Norway, against such as raise storms and tempests; Tempestarii is the name there given them. There were formerly of these impostors on the coasts of Norway, as there are at present on those of Lapland, to whom fear and superstition were long tributary (Mallet, 1809, p163). As older Teutonic mythologies gave way to Christian theology, the control of the weather became more closely associated with demons, who the tempestarii were presumed to control through witchcraft. There was also definitely an inclination to regard tempestarii as women, in contrast with the “malefici” magicians that were often both men and women. In toxicology or poisons, Scandinavian females excelled German matrons. Heuta, a Danish lady of high rank, was so erudite in the preparation of such drugs, that she compounded a philter by which the Norweigian ruler Hringwen was fascinated, and remained her lover for many years. Teutonic maidens, dexterous in this art, appear to have confined the practical application of this science to the strict limits of medical economy, at times, indeed, exercising supernatural power to soften the minds of men to benevolence and mercy, over which they glorified the control.” In addition to this knowledge, they were accorded the power of raising storms and tempests, and were generally classified as Tempestarii. These destructive disturbances, it was claimed, originated in the Runic effigies, as personifying an evil spirit, controlled by the material type, and in its general signification corroborated popular belief among Christian converts of demoniacal creation of natural phenomena (Fort, 1883, p186). This raised some important theological considerations for Christian theologians, since imbuing destructive natural weather phenomena with an infernal origin implied that the omnipotent, omniscient Christian God was asleep at that wheel. “I might also mention those magicians whose specialty it is to let loose hurricanes, and who are designated by the Roman or Feudal laws under the names missarer tempestatum tempestarii. I pause, however, and renew my fundamental question: Are we still upon Evangelical ground? Can the supernatural of the Middle Ages be reconciled with the declarations of Scripture? No. According to Scripture, one Being alone sends disease and its cure; One alone governs the Universe, and disposes of our destinies: it is God. “The Lord killeth and maketh alive: he bringeth down to the grave, and bringeth up. The Lord maketh poor, and maketh rich: He bringeth low and lifteth up” (Gasparin, 1857, p362). European peasants, on the other hand, didn’t waffle on the question of whether tempestarii existed. Whenever the rumbling of thunder was heard it was a customary remark that a sorcerer’s wind was coming. These Tempestarii carried on their nefarious trade in secrecy, but there was a recognized class of practitioners who professed to be able to neutralize them, and were regularly paid for doing so with a portion of the crops, which came to be known as the “canonical portion,” and men who paid no tithes and gave nothing in charity were regular in contributing to these impostors (Lea, 1887, p415). By the 8th-9th Centuries, concern over tempestarii manifested in numerous laws specifically targeted at them, and throughout the Middle Ages, laws continued to be enacted, and papal bulls issued that declared against the tempestarii. In the middle ages, a belief in these weather-makers became nearly universal. A ninth century writer, Agobard, tells us: “In these districts, almost all persons, noble and plebeian, townsmen and rustics, believe that hail and thunder may be produced at the will of man, that is, by the incantations of certain men who are called tempestarii It was generally believed that these sent hail stones from their ships in the upper air, to pelt off the fruit.” He says, that when people were asked, what they meant by “the storm being raised,” some, with little hesitation, as is usual with the ignorant, declare that it is from the incantations of these persons, called tempestarii, and utter execrations against them. In Germany, about 1000 A.D., certain “Defensores” were credited with these weather-raising powers. In a middle-age confessional, a question as to belief in weather-makers was inserted, and penances imposed for such beliefs. Laws were also passed against such persons- Mallet says there are such laws in the statutes of Charlemagne, and in ancient statutes of Norway. Later, French and Italian laws declared it a penal offense to become a weather-maker. The pope joined in the crusade against such persons, and declared against them in two bulls, issued in 1317 and 1327 (Bassett, 1885, p103-104). Obviously, you can’t just legislate against something and expect to be taken seriously. You have to offer people some kind of conspiracy, and a bunch of nasties out there looking to screw you over. Demons are a hard sell when it comes to weather. You’ve got your good weather, you’ve got your bad weather, and everyone has their personal preferences. Some people like fog, for instance, while others just consider it a driving hazard. This did not prevent countless medieval religious councils from proposing specifically anti-tempestarii laws, and differentiating them from other kinds of sorcerers in terms of punishment. Just keep in mind that when it came to medieval punishments for witchcraft, we’re splitting some pretty fine hairs, since you were likely going to end up horribly maimed or dead either way. 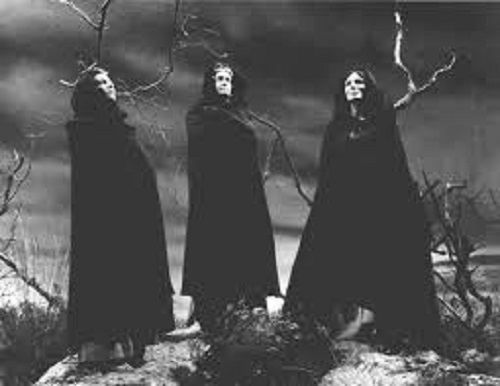 Interestingly, the musings about tempestarii from the 9th Century onward pushed the idea that these particular witches weren’t just manipulating the weather for shits and giggles, rather they were agents of a civilization based in the sky called Magonia. Magonia evidently had a food shortage, and contracted with tempestarii to whip up storms in order to knock fruit from the trees and level crops. The Magonians would then sail in on their sky ships and collect the debris. The Bavarian synods of Reisbach, Freising and Salzburg (799-800) decreed that all magicians and witches as well as the tempestarii (weather-makers) should be imprisoned by the archpriest and tortured until they confessed, but their life was to be spared. The penitentials of this period grouped the witches into two great classes, the malefici and the tempestarii. To the former division belonged those who through their devices injured or killed, “maleficio interimere, decipere, perdere, occidere, maleficio partum decipere, maleficium esse pro amore, pro inlecebroso amore dare, veneficio uti, alicujus amoris gratia.” For such persons the penance lasted for seven years, but if they also sacrificed to demons, the penance was for ten years. The second group, the tempestarii or immissores tempestatum, whose mission was to cause great havoc by storms of rain or hail, were also sentenced to seven years penance…Agobard, the great archbishop of Lyons (d. 841) wrote in 820 that in his diocese, everyone believed in the possibility of tempest-making by witches, that all classes of people believed in a land called Magonia, whence ships came in the clouds and carried back the harvests destroyed by hail; the tempestarii, as such sorcerers were called, were paid by the Magonians for creating the storm. Agobard held that only God and His servants could produce storms, that the minions of Satan had not that power; this belief was destined to be later overthrown. Agobard concludes his exposition with the statement, ‘Christians now believe such silly things as formerly no heathen would have believed ‘ (Pratt, 1915, p36-38). Agobard of Lyon (779-840 A.D.) was a Spanish-born priest and archbishop of Lyon, during the Carolingian Renaissance, and initially had a great deal to say about tempestarii, but later in life concluded that the whole thing was a bunch of hogwash. Interestingly, Gervase of Tilbury (1150 –1228 A.D.) recorded a story, often included in the canon of early UFO literature, describing the visit of a Magonian sky-ship and the capture of a few of its crew. In the time of St. Agobard, Archbishop of Lyons, he says it was a universal belief in his province that a species of sorcerers called the Tempestarii were employed by the people of a region known as Magonia to bring on storms which injured the crops, and that the crops so injured by storm and hail were carried to the Magonians in ships that came in the clouds. At one time three men and a woman, who were said to have fallen from one of the ships of the Magonians, were seized and carried in chains before an assembly of the people, who condemned them to be stoned to death, from which fate they were only saved by the intercession of the Archbishop. The storms raised by these Tempestarii could be counteracted by employing certain practitioners, who accepted as a recompense there for a certain percentage of the crops which they saved (Burdick, 1905, p113-114). Agobard’s primary concern, in addition to his constant raving about pagan beliefs, may very well have been the amount of money the church was losing to the tempestarii, coming to the convenient conclusion that they don’t exist. And if the tempestarri don’t exist and you want to make sure your fields don’t get wiped out in the next storm, who are you going to call? Well, if your answer is the local Catholic priest, you better make sure you’re tithes are all paid up. The Tithe raised on the harvests of the peasants and the nobles in favor of the Church, was, in the beginning, optional; just as it is in Ireland at the present hour; it was paid alike to the priest and sorcerer. Agobard, an archbishop of the 9th century, complains that the ecclesiastical tithe is paid with far less regularity than that accorded to the tempestarii, men endowed with the power to lay storms and conjure up foul weather (Lafargue, 1910, p107). It seems that the church got wise, and realized that when they took over responsibility for the weather control racket, the peasentry might also hold them responsible when all that tithng and praying didn’t pay off, that is, when the crop failed, people would be looking for someone to blame, whether a tempestarii or a priest. This of course led to some quick papal rewrites that said neither tempestarii nor priests should be accountable for natural disasters. That’s some fancy footwork. Pope Gregory VII. on April 19, 1080, enjoined on King Harold of Denmark that ‘ he must no longer tolerate among his people the gruesome superstition according to which Christian priests or wicked women were held answerable for bad weather, storms, unfruitful years, or outbreaks of plagues (Janssen, 1896, p226-227). Before we assume that such notions are distant memories that only plagued us in the depths of the Dark Ages, it seems that the belief persisted among the common folk until well into the 19th Century. We shall no longer doubt this, when we find that in the eighth and ninth centuries, among the number of magicians proscribed by Charlemagne, some were designated by the name of tempestarii, or those who regulated storms, tempests, and hail. Did this superstitious belief, and the agitation excited by it everywhere disappear before the progress of civilization? We believe not. On one occasion, when excessive rains were unpropitious to the labours, and destroyed the hopes of the agriculturist, the long continuation of these evils were attributed by the multitude to the sorceries of a woman who had arrived in the country to exhibit the spectacle, a hundred times repeated, of an aerostatic ascension. This persuasion spread and acquired so much force, that the aeronaut was obliged to take precautions for her safety; or to run the risk of being burned alive by men about as enlightened as those who formerly applauded the murder of Sopater. Who, we may inquire, were these men? They were peasants in the environs of Brussels, and the inhabitants of the town itself; and the date of the event was so recent as 1828 (Salverte, 1846, p165-166). With all our modern technology, we’re still rather awful at predicting the weather. And when it comes to whether there will be food on the table this winter, we tend to like a little bit of predictability. Let’s face it, farming is grueling labor, and nobody likes to see their hard work eradicated by a freak act of nature. We might want to consider getting rid of our modern meteorologists and bringing back the tempestarii, because at least then we could feel like we had a hand in our own fate. Maybe they can help with this whole global warming thing, since nobody else seems interested. And for god’s sake, stay out of tents. Those things are bad weather magnets, as observed by Dave Barry who said, “It always rains on tents. Rainstorms will travel thousands of miles, against prevailing winds for the opportunity to rain on a tent”. Burdick, Lewis Dayton. Magic And Husbandry: the Folk-lore of Agriculture; Rites, Ceremonies, Customs, And Beliefs Connected With Pastoral Life And the Cultivation of the Soil; With Breeding And the Care of Cattle; With Fruit-growing, Bees, And Fowls. Binghamton, N.Y.: The Otseningo publishing co., 1905. Dalyell, John Graham, Sir, 1775-1851. The Darker Superstitions of Scotland. Glasgow: R. Griffin & co., 1835. Fort, George F. Medical Economy During the Middle Ages: a Contribution to the History of European Morals From the Time of the Roman Empire to the Close of the Fourteenth Century. New York: J. W. Bouton, 1883. Gasparin, Agénor, comte de, 1810-1871. A Treatise On Turning Tables: the Supernatural In General, And Spirits. New York: Kiggins, 1857. Grimm, Jacob, 1785-1863. Teutonic Mythology. London: W. Swan Sonnenschein & Allen, 1880. Janssen, Johannes, 1829-1891. History of the German People At the Close of the Middle Ages. London: K. Paul, Trench, Trübner, & Co., Ltd., 1896. Lafargue, Paul, 1842-1911. The Evolution of Property From Savagery to Civilization. Chicago: C. H. Kerr & co., 1910. Lea, Henry Charles, 1825-1909. A History of the Inquisition of the Middle Ages. New York: Harper & brothers, 1887. MacCulloch, J. A. 1868-1950. The Religion of the Ancient Celts. Edinburgh: T. & T. Clark, 1911. Mallet, Paul Henri, 1730-1807. Northern Antiquities: Or, A Description of the Manners, Customs, Religion And Laws of the Ancient Danes … With a Translation of the Edda … Tr. From “L’introduction À L’histoire De Dannemarc, &c., Par Mons. Mallet.” With Additional Notes by the English Translator, And Goranson’s Latin Version of the Edda … Edinburgh: Printed by C. Stewart, 1809. Pratt, Antoinette Marie, 1878-. The Attitude of the Catholic Church Towards Withcraft And the Allied Practices of Sorcery And Magic. Washington, D.C: [National capital press, inc.], 1915. Rae, Edward, 1847-. The White Sea Peninsula, a Journey In Russian Lapland And Karelia. London: J. Murray, 1881. Salverte, Eusèbe, 1771-1839. The Occult Sciences: The Philosophy of Magic, Prodigies And Apparent Miracles. London: R. Bentley, 1846. Formally praying for rain still exists now, even by governors of drought-stricken states. http://www.npr.org/templates/story/story.php?storyId=16281915. Other states include Tennessee and Texas. It will be interesting to see when and if California finally resorts to prayer – the hardest state of all for lawmakers to bend the knee. This is really interesting. I had no idea there were so many different traditions/ideas on witches and weather. I’ll be sharing this one. Add this to your “Getting Ready For Halloween” list. Heck, add it to your every single day list. All about witches and the weather. And if you aren’t following EsoterX you ought to be. Wonderful well written smart blog and you’ll always learn something interesting and unusual there. Very fascinating, it was researching witches and weather for a novel that started my journey with all things “witchy and weird” over at winsham.blogspot.com. Will be following, and have retweeted over on twitter. Great to find you.